The best soups taste amazing, provide rich nutrition, and warm you up when it's chilly outside. They can also save you money since you can use leftovers and prep them in advance so you're less likely to spend money on takeout, as well as time (make a lot one time, possibly even in a slow-cooker). Little House Living's French onion soup has been repinned on Pinterest 22,000 times and shared to Facebook just over 500 times. The recipe recommends gruyère cheese, but you can use swiss or mozzarella in its place if you'd like. It also has focaccia bread baked on top, which won't get as soggy as some other options. You can use red wine as part of the broth for the richest flavor, but if you prefer to skip the wine, just substitute that amount of liquid with more beef broth. Craving that pop of flavor that only chicken tortilla soup can provide? AllRecipes.com has you covered with their recipe that has a 4.7-star rating and over 1,200 reviews. Quite possibly the best part? It only takes 40 minutes to make. Enjoy the flavor blend of green chile peppers, green onions, avocado, Monterey Jack cheese, chili powder, and more, all in one quick and easy recipe. The Delicious Ham and Potato Soup from AllRecipes.com has almost 10,000 reviews and a 5.0-star rating. It uses all the basic ingredients of a potato soup, like diced potatoes, flour, butter, milk, onions, and chicken bouillon. Extras like the diced ham and celery take it up a notch. Serve it with a salad or roasted vegetables. MizzNezz' chicken noodle soup recipe is an Editor's Pick at Genius Kitchen and has a nearly perfect score, even with almost 500 reviews. It's straightforward, has all the comforting flavors you'd expect from a chicken soup, and is sure to warm you up on a cold day or make you feel at least a little better when you're feeling under the weather. Carla's Tomato Soup made Epicurious' list of most satisfying soup recipes. This isn't your average tomato soup. It incorporates the flavors of fennel seeds, cayenne, smoked paprika, and shallots to take tomato soup to a new level. Enjoy it with thick, country-style bread. With just under 70 reviews and an almost-perfect score, Genius Kitchen's Crock Pot Ham Bone and Bean Soup recipe is a winner. You'll need a ham bone or ham hocks to flavor this one, and it uses Great Northern beans instead of the black beans that are common in many bean soup recipes. The best part? Set this one up in advance and have dinner ready when you walk in the door after work. The Cheeseburger Soup is a community pick at Genius Kitchen. It has 112 reviews and an almost-perfect score. The combination of ground beef, cheese, and vegetables should keep you full for an hour. Feel free to pair it up with a side salad for an even more balanced, filling meal. Do you love lentils? Lentil soup is the perfect solution for vegetarians or those who enjoy Meatless Mondays. The best lentil soup is from FoodNetwork.com's Alton Brown, and users rate it 5 out of 5 stars. Along with the pound of lentils the recipe calls for, you'll use onions, carrots, tomatoes, toasted cumin, coriander, and grains of paradise. 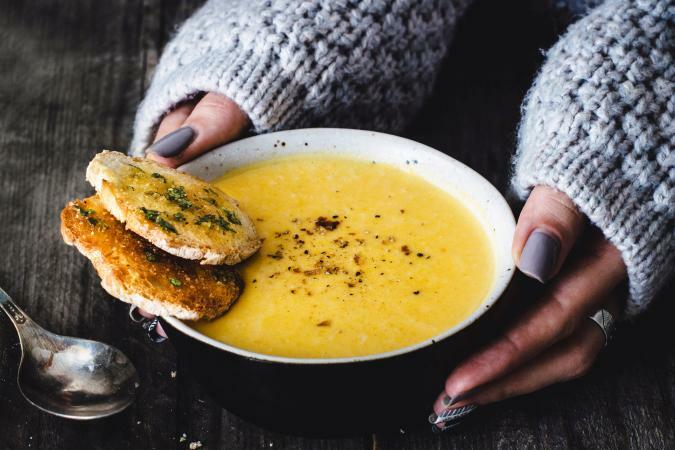 It's an unusual twist on a classic but not so far from a basic lentil soup recipe that picky eaters will dismiss it right away. You can find the best Mulligatawny soup at AllRecipes.com. With over 1,100 reviews, it still has a 5.0-star rating. The combination of curry, pepper, heavy cream, broth, chicken, vegetables, apple, and rice makes this a smooth, savory, and satisfying option. You won't even need sides. The Minestrone at FoodNetwork.com only takes 45 minutes to make. If you switch the chicken broth to vegetable broth, it's also vegetarian-friendly. With 161 reviews, it has a 5.0-star rating. It calls for carrots, onions, celery, kidney beans, green beans, tomatoes, elbow pasta, and spices and it makes for a lighter option. If you don't like heavier, creamy soups, or you just need something you can throw together in under an hour, this one's for you.